Jerri and Jolee stayed for a few days after the Walk so that we could do some other activities. Jolee drove out to Bullhead City, AZ on Monday to pick up her kids, Dalan and Megan, and brought them back to my place. That was a very long day for her. But I was glad that she made that long drive because I love being with the kids. We all had to go over to the Donate Life office because I had accidentally made off with the keys to the cool new Donate Life van (I was unloading it from the Run/Walk and forgot they were in my pocket). 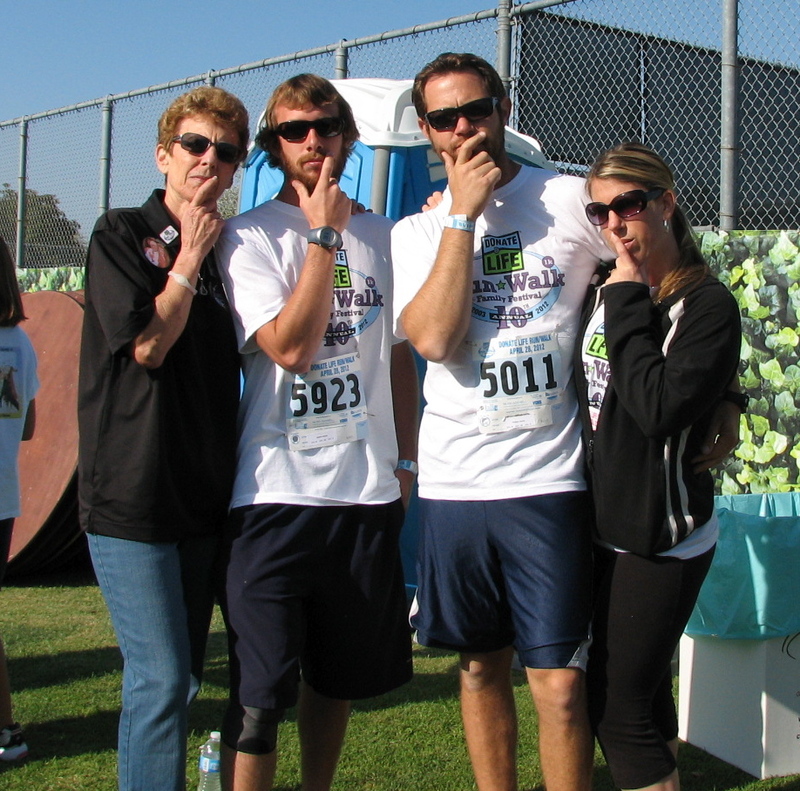 Jerri, Jolee and I were going to take a repeat picture in front of the Porta Potty at the Walk (like Jolee, Jason, Scott and I did last year) but we forgot to do so. So we did the next best thing at the Donate Life office. 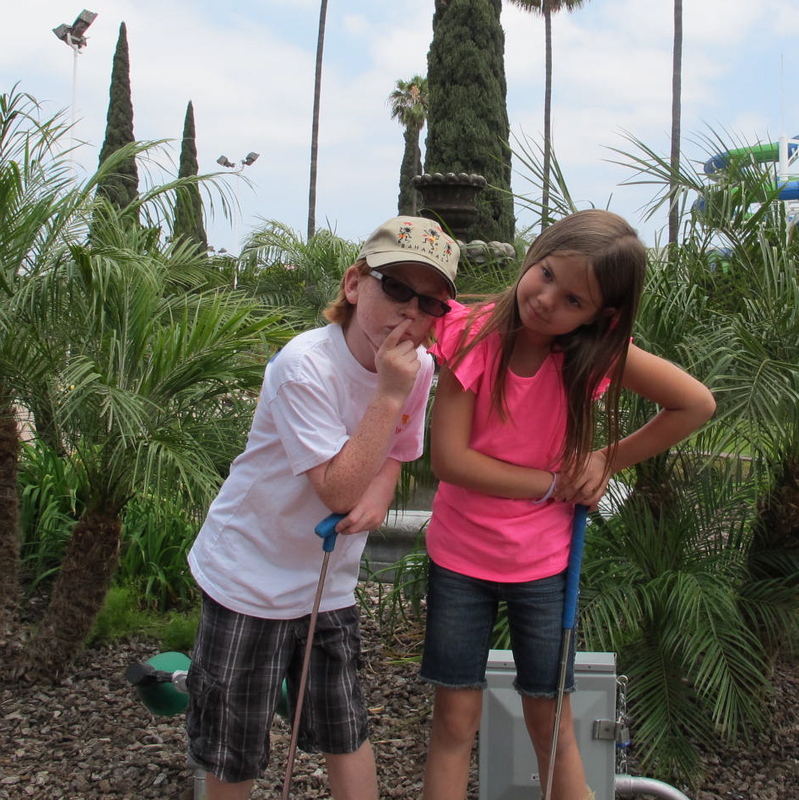 After our poses, we went over to Camelot Entertainment Center or whatever it’s called for a game of rip roarin’ miniature golf. It was roarin’ because we could hardly hear at times because the course is right next to the 91 freeway. But we persevered and had a really good time. My day got off to a good start with a hole in one and then quickly deteriorated. Megan ended her day just right with a hole in one! It was a hard course and this was a pick me up for her! We all had a good time and enjoyed ourselves. We really had a good time and got our money’s worth because we all had many,many strokes. You can tell Dalan and Megan had a good time, too. Megan’s checking out Dalan’s pose to see if Uncle Scott would approve. 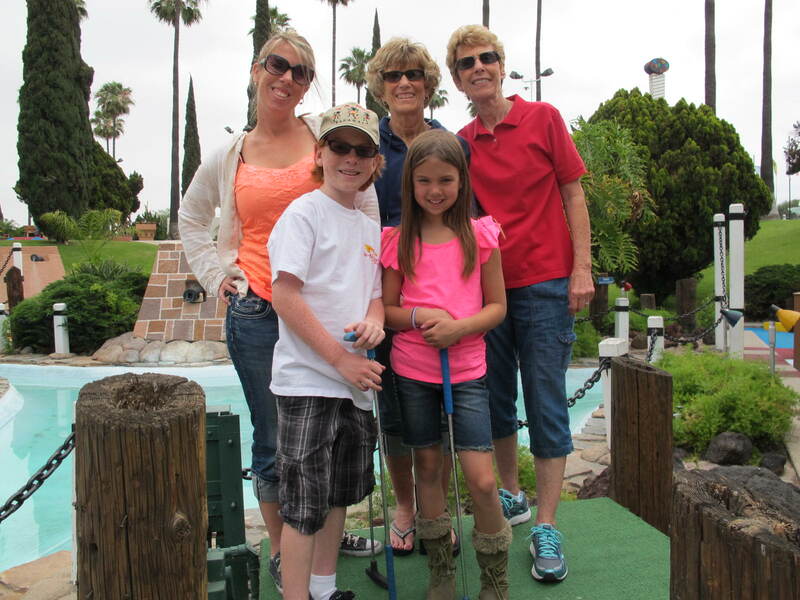 The next day, we enjoyed a game of bowling and a great afternoon at the Discovery Museum in Santa Ana. It’s supposed to be for kids, but I really enjoy playing with the scientific gadgets and learning stuff. The kids enjoyed doing a type of scavenger hunt in the dinosaur area. Dalan enjoyed it so much that he did five different hunts. He got to be pretty good at it. He went home with a pocketful of wooden coins that were given as prizes for completing a hunt. Much to my chagrin, they all had to leave the next day because things at home were calling them. It sure was quiet that night without listening to chatter, questions and some bickering. Kinda reminded me of Jerri’s and my childhood when they were at my place.